The Alaska Volcano Observatory (AVO) has raised the Aviation Color Code to Orange and the Volcano Alert Level to Watch for Veniaminof volcano at 21:29 UTC on September 4, 2018. The last known eruption of this volcano took place in 2013. The decision to raise alerts was made after a sharp rise in seismic activity as well as low-level ash emissions observed in web camera images and confirmed by observers in Perryville. Veniaminof's previous eruption (in 2013) started 5 days after AVO detected a gradually increasing seismic tremor on June 8 and persistent steam plume since June 10. On June 13, a pilot observed ash at an altitude of 3.7 km (12 000 feet) above sea level and lava flow effusing from the intra-caldera cinder cone. Satellite images showed very high elevated surface temperatures at the intra-caldera cinder cone during June 15 to 18. The eruption ended on October 12, 2018. It had Volcanic Explosivity Index of 3. Veniaminof is monitored with a local real-time seismic network, which will typically allow AVO to detect changes in unrest that may lead to an explosive eruption. Rapid detection of an ash-producing eruption would be accomplished using a combination of seismic, infrasound, lightning, and satellite data. 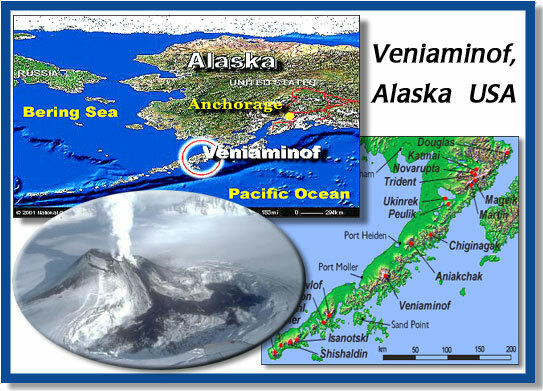 Mount Veniaminof volcano is an andesitic stratovolcano with an ice-filled 10-km (6.2 miles)diameter summit caldera located on the Alaska Peninsula, 775 km (480 miles) southwest of Anchorage and 35 km (22 miles) north of Perryville. Veniaminof is one of the largest (~300 km3; 77 mi3) and most active volcanic centers in the Aleutian Arc and has erupted at least 13 times in the past 200 years. Recent significant eruptions of the volcano occurred in 1993-95, 2005, and 2013. These were Strombolian eruptions that produced lava fountains and minor emissions of ash and gas from the main intra-caldera cone. During the 1993-95 activity, a small lava flow was extruded, and in 2013, five small lava flows effused from the intra-caldera cone over about five months. Minor ash-producing explosions occurred nearly annually between 2002 and 2010. Previous historical eruptions have produced ash plumes that reached 20,000 ft above sea level (1939 and 1956) and ash fallout that blanketed areas within about 40 km (25 miles) of the volcano (1939).